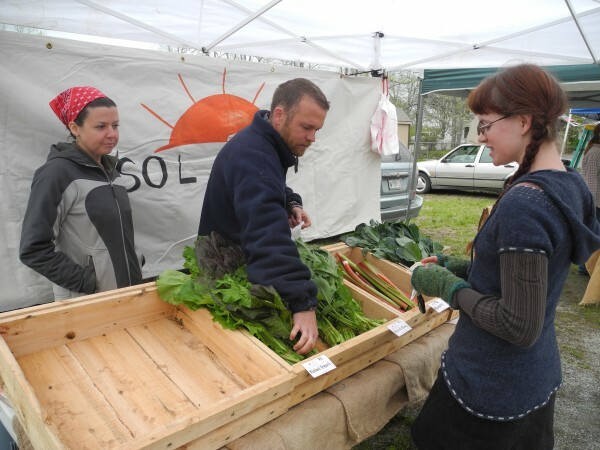 Ashleigh Russell of Belfast purchases lacinato kale and mustard greens Friday morning from farmers Rachele Leonard (left) and Josh Oxley of Sol Farm in Monroe. "We've had a lot of early springs in the last seven years. This might be more typical," Oxley said. BELFAST, Maine — On a cool, damp morning, an eager crowd of shoppers came to the Belfast Farmers’ Market, where they found live music, hot crepes, cheese, meats, bread and seedlings. What they couldn’t buy was much in the way of farm-fresh vegetables, even though it was the third week of May. Only rhubarb and a few types of greens decked the booths of local farmers, who said that wet fields and the colder-than-normal temperatures lingering over Maine have slowed them down. In fact, it may be the most sluggish start to the growing season in almost a decade, according to gardening expert Barbara Murphy, the University of Maine Cooperative Extension educator in Oxford County. Numbers from the National Weather Service show that in April, Portland had experienced below-normal temperatures for six straight months, and that snow was on the ground for 121 consecutive days. Throughout eastern Maine, temperatures in April were slightly below normal and precipitation has been as much as 170 percent of normal. Murphy said last week that it has been a year of high anxiety among home gardeners and others. People are asking her if it is ever going to warm up and dry out. The answer, she said, is yes. The numbers of home gardeners in Maine has been increasing since the Great Recession set in, and many of those people may not remember the colder, slower springs of past years. She said that hardy crops such as broccoli, cabbage, cauliflower, radishes, scallions, leafy greens and potatoes can be in the ground now, but she cautioned gardeners to wait before putting in tomato plants. She also urged them to remember to enjoy the work. “It should not just be another chore,” Murphy said. Luke Donahue, a sales representative for Johnny’s Selected Seeds of Fairfield, said that his farming clients have said that everything is two weeks late. Mark Hutchinson, also a University of Maine Cooperative Extension professor in Knox and Lincoln counties, said last week that he works a lot with small fruit and vegetable producers. He’s encouraging them to stay off wet soil, which can quickly be damaged by tilling. “A good rule of thumb: If it sticks to your plow or shovel, it’s probably too wet to work with,” he said. He said he’s heard from other experts that this cold, wet, slow spring looks an awful lot like what was normal in past years.